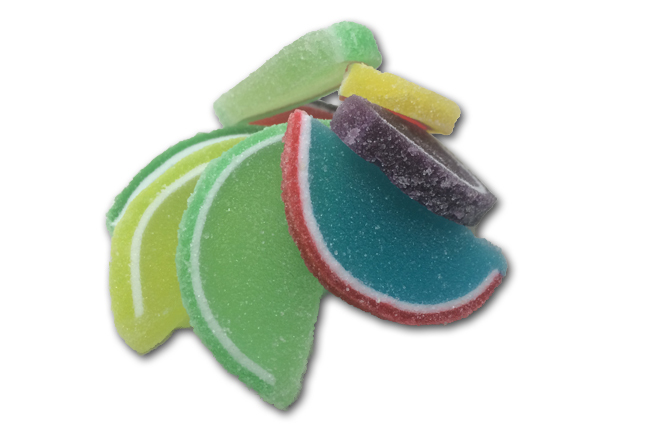 My brother has adored these classic fruit slice candies for quite some time. It’s not that I didn’t like them-I just rarely, if ever had them, so they weren’t on my radar. 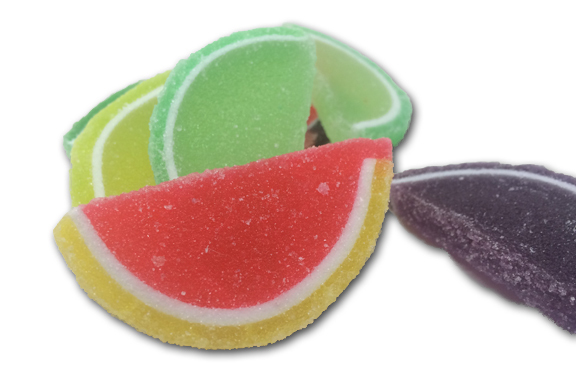 Recently though, with my semi newfound obsession with fruit jellies, I started thinking about them- they’re really colorful and LOOK cool..so it became clear that it was time for me to try them. I started with with the dark green one, second from the right in the top row. Immediately, I was impressed-there was a very nice, luxurious consistency like I was hoping for. Not too soft, not too hard, but good and firm. And the flavor was impressive-I’m not sure I if it was apple, but I think it was. They key though was the dynamic nature of the taste-it had a very full sweet flavor, but more than enough slight tartness to really make the taste great. I even gave the Mrs. a bite-she usually isn’t into fruit jellies, but even she admitted that this one was good. Now I was excited. One piece down & seven to go, deliciousness on the horizon. However…I’m quite sorry to report that none of the other flavors came close to the quality of that first one. Flavors subsided across the board, and that zingy tart note I had in the first slice was almost complexly missing from the rest. This was a weird one for me- I don’t think I’ve ever experienced one flavor of a candy being so far above the rest, but…that’s what we got here. 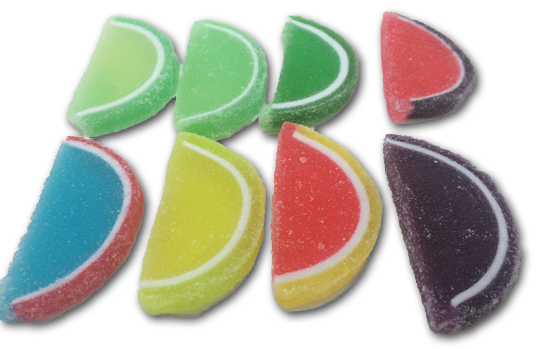 Im open to trying other iterations of fruit slices-in fact I want to, so bring on the suggestions. But as for these Alabanese slices- I can’t recommend them. Which is odd, considering how on point their gummy bears are.